Paul Andreu (10 July 1938 – 11 October 2018) was a French architect, known for his designs of multiple airports such as Charles de Gaulle Airport in Paris, and multiple prestigious projects in China, including the National Centre for the Performing Arts in Beijing. Andreu was responsible for the design of numerous airports, including Ninoy Aquino International Airport (Manila), Soekarno-Hatta International Airport (Jakarta), Shanghai Pudong International Airport in China, Abu Dhabi International Airport, Dubai International Airport, Cairo International Airport, Brunei International Airport, and the Charles de Gaulle Airport, and Orly Airport in Paris. He was in charge of planning and constructing Charles de Gaulle Airport (Roissy) in Paris from 1967 on. 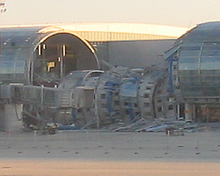 On 23 May 2004 a portion of Terminal 2E collapsed, killing four people. Terminal 2E, inaugurated in 2003, is the seventh terminal at Roissy by Andreu, and has been described as one of Andreu's boldest designs. The collapse was attributed by the ad hoc administrative enquiry commission to a variety of technical causes and the lack of margins of safety in the design. Andreu blamed the collapse on poor execution by the building companies. Andreu's other projects included the Grande Arche at La Défense in Paris (as associate of Johann Otto von Spreckelsen) and the National Grand Theater of China enclosed in a titanium and glass shell near Beijing's Tiananmen Square which was inaugurated on 22 December 2007. In 2008, Andreu was hired to design a cultural centre and ticket office in Montreal's new Quartier des Spectacles entertainment district. In 2011 Andreu became dean emeritus and chair professor of the Architecture Department at Zhejiang University in Hangzhou, China, where he taught three months per year. ^ "Obituary: Paul Andreu, 1938–2018". Architectural Record. 2018-10-12. Retrieved 2018-10-13. ^ "Paul Andreu – French architect and engineer mostly noted for his numerous airport designs". Structurae.net /. Retrieved 2015-09-13. ^ "Biographie". Academie des beaux arts. Retrieved 2015-09-13. ^ "Profile: Paul Andreu". BBC. 2004-05-24. Retrieved 2015-09-20. ^ China's national theater makes debut, International Herald Tribune, 23 december 2007. ^ "Montreal entertainment district building to go up without federal help". CBC.ca. October 24, 2008. Retrieved 2015-09-20.